A myth is a sacred narrative because it holds religious or spiritual significance for those who tell it. Myths also … express a culture’s systems of thought and values as the myth of gremlins invented by aircraft technicians during World War II to avoid apportioning blame. [E]nemy aircraft had similar and equally inexplicable mechanical problems. As such, gremlins were portrayed as being equal opportunity tricksters, taking no sides in the conflict, and acting out their mischief from their own self-interest. But we digress… The point is this: There is a solid basis in historical fact for believing in both “jolly old St. Nick” and in the spirit of Christmas. The best-known story involves a man with three unmarried daughters, and not enough money to provide them with suitable dowries. This meant that they could not marry, and were likely to end up as prostitutes. Nicholas walked by the man’s house on three successive nights, and each time threw a bag of gold in through a window… Thus, the daughters were saved from a life of shame, and all got married and lived happily ever after. Dutch colonists took this tradition [of St. Nicholas] with them to New Amsterdam (now New York City) in the American colonies in the 17th century. Sinterklaas was adopted by the country’s English-speaking majority under the name Santa Claus, and his legend of a kindly old man was united with old Nordic folktales of a magician who punished naughty children and rewarded good children with presents. His authority was such that the executioner left his sword where it fell. 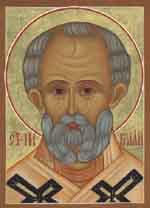 Later Eustathius confessed his sin and sought the saint’s forgiveness. Nicholas absolved him, but only after the ruler had undergone a period of repentance. So there you have it. The real “Ol’ Saint Nick” was not only jolly, he was personally brave. Simply put, Christmas became big business. And as such it spawned a host of new cottage industries: Books published, woodsmen “heading into the forests each December to cut evergreens to sell on street corners,” tinsel, toys, candle-holders, candles, candies, garlands, ornaments, and hand-colored Christmas cards, to name a few. All of which is wonderful for the economy. But each Christmas it’s also a good idea to go back to the original source. 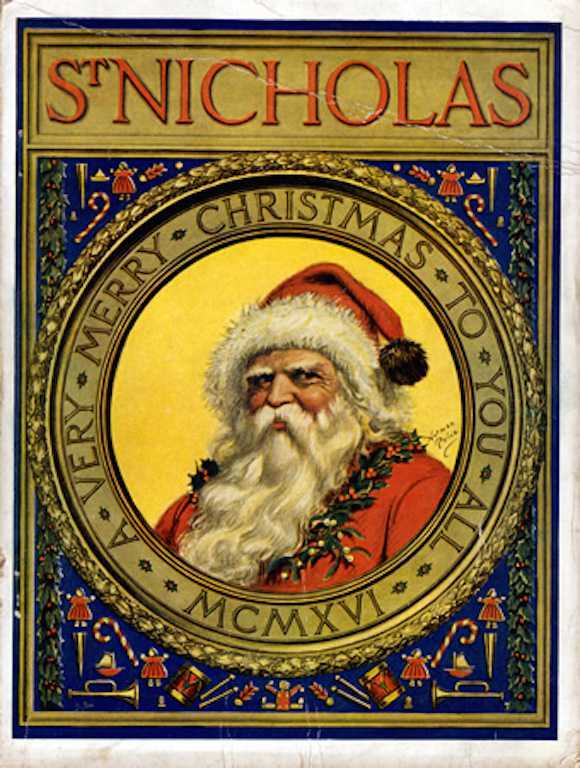 To go back to the jolly – and brave – original St. Nick. (Seen below, in action.) And of course to remember Jesus, The Reason for the Season. “Note” also that an asterisk in the main text indicates a statement with a reference detailed further in this, the “notes” section. Thus, as to St. Nicholas’ day, it’s only a Feast in the Daily Office Lectionary, not in the Revised Common Lectionary used for Sundays Bible readings. Under the “RCL” – detailed at The Lectionary Page – there are no listed Feast Days until December 21, for St. Thomas, Apostle. The lower image is courtesy of Saint Nicholas – Wikipedia, the free encyclopedia, with the caption: “Saint Nicholas Saves Three Innocents from Death (oil painting by Ilya Repin, 1888, State Russian Museum).” See also St. Nicholas Center … Saint Who Stopped an Execution. This entry was posted in Daily Office readings, Feast Days on December 6, 2016 by dorscribe@aol.com.